As you look at this site about Bible abuse, you will find two major sections, one that looks at who the people are that abuse the Bible to injure homosexuals; and a second that looks at what the Bible actually says that applies to homosexuals. Before these, though, to help you understand them, first there is an overview of the goals of the site and something of the history of bibles and the nature and challenges of translation (all bibles currently in use are translations, of course). To make it clear, it is not the goal here either to debate the relevance or infallibility of biblical scripture or to proselytize; the two goals are as embodied in the two major sections. The first goal is to look at exactly who it is that commits abuse of the Bible and directs it at homosexuals – and why. This is not, as some would have you believe, everybody except the homosexual fringe. Second, the site tries to determine what the original biblical texts actually say (as opposed to what people with political – not Christian – agendas would have them say). Unfortunately, this is not at all a simple process. The languages in which the Bible was first written down have all changed beyond recognition by modern native speakers of those languages. In addition, the cultures for and about which the Bible was written – both before the Exile and once the remnants of Judah had returned from captivity in Babylon – were strikingly different from modern society (in particular, it must be hoped, in the regard for individual human life). No longer do we prescribe death for an entire city, tribe, or nation for the sins of a few people; no longer are slavery or racial superiority just taken for granted; no longer are women treated as property – women are even able and allowed to read the Bible! Times and languages have changed, and unless a person is seriously deranged enough to advocate the extermination of entire populations simply because models for it occur in the Bible, we must use judgment in applying the lessons of this scripture. Sadly, this is not purely a hypothetical straw horse; genocide does seem to be sanctioned by the supposedly Christian groups Second Billion and Watchmen on the Walls. All bibles are not created equal. The first printed translation of the Bible in English, the Tyndale Bible of 1537, was plagued with errors. Subsequent bibles continued some of the questionable translations of that and earlier bibles, and one point of this web site is that we still suffer under the effect of this today. Furthermore, though translations of critical words and phrases have varied over time, translations of the supposedly anti-gay passages seem to have settled into anti-gay translations across Western culture generally (i.e., across different languages, not just in English). The name of a specific version is set in italics like any other book (the 2005 New English Translation). However, when such works often have many, differing editions, they are not italicized when the entire group of editions is referred to (the Living Bible). When used to apply to the entire mass of sacred writings as a single group, ‘bible’ is capitalized (the Bible; this also applies to the capitalization but not italicization of the Qur’an and the Talmud); but when it has a generic meaning such as when used to indicate the primary reference source (“That repair manual is his bible”), it is not. This pattern holds true for adjectives as well – where the reference is to the specific, capitalized noun, the adjective is capitalized (“He is a Biblical scholar”); but otherwise it becomes lowercase “It was a mistake of biblical scale.” Names of concepts or objects once generally thought to be so venerable that they were capitalized are avoided here (in modern times this remains the case only for objects so common in literature that the traditional capitalization is still used, such as the Holy Grail). To follow convention used by some, the pronoun ‘he/his/him’ is capitalized when it refers to Christ. The political and grammatical quagmire of a pronoun for God is adeptly dodged. Leviticus 20:13 – “Yf a man lye with the mankynde after the maner as with woma kynd, they haue both comitted an abhominacion and shall dye for it. Their bloude be apon their heed.” That the church tried to suppress this Bible, however, was for political reasons rather than because of its errors or the character of its translations. You can compare translations for yourself via a variety of sites. When this site was assembled in 2008, Bible Gateway was used, with 80 different translations available (20 of these in English); Gateway now has over 130 versions and at least 50 in English. Another site with hundreds of links to versions of bibles is here. It is even possible to go back further than that. Bibles before the Tyndale Bible were, of course, hand-written. 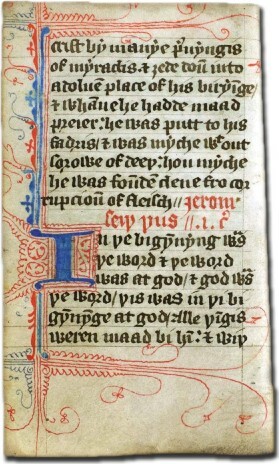 The Wycliffe Bible of 1385, based on the Latin Vulgate, was the first translation of the Bible into English. Among a variety of sites, it can be found at Ibiblio and the Wesley Center Online. Although the Wycliffe Bible had simply been a translation of the Vulgate into English, the Tyndale Bible largely returned to the oldest available sources in the original Bible languages of Hebrew, Greek, and Jesus’ native language, Aramaic. This was closely followed by the Great Bible of 1539, the first translation authorized by the Church of England; but it had relied more heavily on the Vulgate, and it contained lines from the Vulgate that were absent from the original texts. In 1568 the authorized Bishops Bible replaced it; with the exception of the Apocrypha, it was entirely from original sources (whereas the Tyndale Bible was perhaps only 4/5 from originals). This Bible, however, suffered from inconsistencies because it had been produced by many hands without an overall editor; it had un-singable Psalms, and scholars attacked it for inaccuracies. Furthermore, the Geneva Bible of 1560 – first printed in England in 1575 – had language that was more powerful and easier to understand. But the powers-that-be – especially Puritans – were seriously offended by marginal notes in the Geneva Bible (which had a Calvinist character), so in 1604 it was decided that an official, authorized text was needed for the Church of England. This in 1611 yielded the version called the King James Version. Although not highly valued when it was new, the language of the KJV has been burnished by time, and it is beloved today for its beauty. Unfortunately, inevitable changes in language have rendered it obscure or opaque to modern eyes in places, and the twentieth century began to see many attempts to update the Bible so that it returned to full understandability. Be aware, however, that ‘understandable’ is not the same as ‘accurate.’ Mistranslation began with the first Bible in English, the Wycliffe Bible. A particularly well-known example of this is the word ‘abomination’ as applied to homosexuals. The 1385 Wycliffe Bible used it in Leviticus 18:22, and the 1537 Tyndale Bible used it in Leviticus 20:13 as well. Thereafter, at any time in the process that original scriptures were used, the word could have been more accurately translated, but for whatever reason, the term ‘abomination’ persisted in Leviticus until well into the 20th century. This single word is not the only problem affecting passages that supposedly refer to homosexuals. It is merely one of a set of problems that have interfered with a proper understanding of those passages that many assume indicate what the attitude of God might be toward those children of God who are homosexual. Before we look at each of these passages – and at those who abuse them – you need to know some things about translations. Even the best of translators face insuperable problems with the flow, the cadence, the music of a language and with cultural references that would be obvious to people in the culture. Acrostics – in which the first line begins with the first letter of the alphabet and each successive line begins with the next letter of the alphabet – are awkward at best to translate in that form; rhyming poetry is even more problematic; and puns, of course, are almost unsalvageable. Setting these aside – there isn’t much choice, as anyone who reads poetry in translation knows – there are two major considerations in dealing with what translations can reasonably hope to handle. First, translation accuracy. Although you may not be aware of this, it is not easy to make translations that reflect the genuine meaning of the original – especially of material old enough for language and cultural change to have made its meaning uncertain. When that meaning is flatly not known but only reflected by how it has traditionally been translated, errors are particularly hard to avoid. Second, context. The Scriptures were written for people and circumstances that have dramatically changed. No longer (mostly) are whole populations relocated or exterminated; no longer (mostly) are large populations of slaves used to support the ruling classes; no longer (mostly) do families consist of a single husband with multiple wives who are insulated from society; no longer (mostly) are women worth nothing except as child bearers. Assumptions that underlie these four features also underlay the texts of the Bible, as did many other differences. Care must be taken not to distort the Scriptures to make them fit contexts for which they were not intended. There are two other factors that affect translations in dramatic ways. Those who believe in an English language Bible as the unvarying Word of God might be startled to see the differences between any chosen passage in many of the different Bible translations. (Try this at Bible Gateway. Also check the six different translations compared in this site’s look at Matthew 19:12.) These differences are often the result of some significant factors that affect translations. First, languages change over time; any comparison of a passage in the Tyndale Bible of 1537 with any of the several produced in the 20th century will turn up phrases, vocabulary and grammar in Tyndale that are flatly incoherent to the modern eye. The much beloved King James Version, issued in 1611, suffers to a lesser degree from the same problem. How many, for example, recognize the word ‘froward’ (cited in Proverbs 3:32 as an abomination) and know that it means ‘disobedient’? If you do, you know more than the Microsoft Word spell checker. Secondly, the goals of translators may differ. The Bible version called The New Living Translation strives to have an impact on its readers similar to the originals, yet at the same time to be easy to read and understand, paraphrasing thoughts rather than just short phrases. The version called The Message was crafted with the specific goal of reproducing in English the sense of rhythm and vitality of the original languages, whereas most other versions seem to focus much more on imbuing the scriptures with an elevated, formal tone (something notably absent from the original letters that make up much of what is called the New Testament). Basically, translations should try to be faithful to the meanings of their original sources, and they should reflect the contexts in and for which they were written. The Dead Sea Scrolls have now provided us with copies of nearly all of the Hebraic scriptures; most of these are only a few hundred years younger than the documents as they took their final forms (even the oldest parts of the Bible are not over 900 years older than the Scrolls). But the 2000 years between the Scrolls and today is time for a lot of language and cultural change. There is indeed some small variation between older and newer texts – and between different copies of the Scrolls themselves; copyists clearly had leeway to use their discretion in determining the final forms of documents. Citations from each of the major translations are not included with each biblical text discussed (though the discussion of Matthew 19:12 looks at six quite different translations), for two reasons. First, there are too many of these, and some translations don’t appear to be available or are only partly available on the Internet. Secondly, there is little reason to include each available translation at times that all are the same in meaning and very similar in wording. You might want, having waded through all this introductory stuff, to go straight to the Bible passages that are used against gays. Logical. Understand this, though: the passages are fundamentally irrelevant to the problem of Bible abuse; and knowing why this is true could affect your understanding of the passages themselves. The problem is vastly deeper than simply a matter of what scriptures do or do not say. It can hardly hurt to learn something about the minds of those who mindlessly abuse gays, can it? Link color guide: Links to additional information that pops up on this page are in dark red. Links to other articles which stay within this discussion are in dark goldenrod. Unvisited links to articles on other websites are in blue unless your browser designates otherwise. Published by the St. John’s MCC Community Website. January 26, 2009. Some portions revised October 31, 2009, minor revisions made February 3, 2012, and migration to this new domain on June 8, 2014 - which happened to be Pentecost Sunday. Additional revisions were made to the Leviticus section on February 8, 2017. This is an example of additional information that you can access by clicking on the dark red links.